I want to start this post with three quotes relating to the growing momentum and recognition among researchers, regulatory agencies, policy makers and payers towards a more patient-centric approach to clinical trials and outcomes development. Although patient-centricity might be pharma’s buzzword of the decade, it has so far generated little more than slogans. In a recent white paper: The Future of Clinical Trials: How Bringing Patients to the Centre can Cut Costs and Deliver Better Outcomes Anne Beal makes the important distinction between patient centricity and patient engagement. Putting this into a patient reported outcome (PRO) context, the outcome must be patient centric, in other words must be related to the needs etc. of the patient but, how do we achieve this? The how? The answer is through “patient engagement”. In the UK funding bodies such as the National Institute for Health Research (NIHR) as well as the National Research Ethics Service (NRES) are requesting grant applicants to provide evidence of their plans for patient and public involvement (PPI) in the research. So in this context patient engagement is already on the agenda. Establishing content validity of a PRO to ensure it measures the concept(s) of interest and that the items and domains are both relevant, traditionally focuses on a combination of a review of the relevant literature and input from clinicians and patient engagement through in–depth interviews, focus groups and online concept elicitation surveys. Although a powerful approach for identifying issue relevant to the patient, the emphasis remains very much based around patients responding to the issues previously identified by the researcher as relevant and which form the basis of the interview discussion guide as an aide memoire. Pretty much the same can be said for using focus groups for generating valid PRO content. 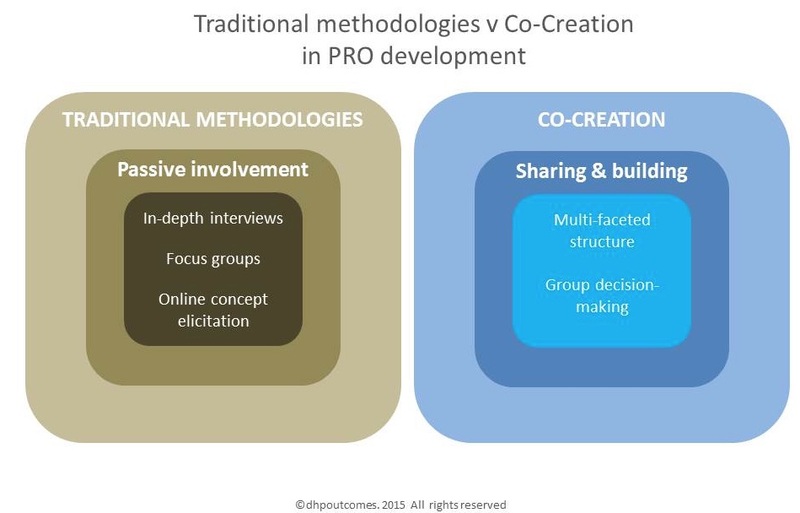 An alternative approach is co-creation,which ensures the patient is at the heart of the process whether it is PRO development or designing a patient-centric clinical trial. Co-Creation is not new to brand development with companies such as Coca-Cola and Microsoft using the approach to tap into the insights of their customers. The term co-creation is used fairly indiscriminately and with a lack of conceptual clarity. It should however, not be confused with concepts such as ‘crowdsourcing’ or ‘user generated content’. Co-creation is creative as a form of collaborative creativity.’ It’s a rich mix drawing on a combination of knowledge, and group decision-making. It’s the process of involving the client/customer/patient in the creation of meaning and value. Developing a PRO patient-centric clinical trial through co-creation brings patients and key stakeholders (e.g. researchers, clinicians, pharmaceutical advisors) together and who are tasked to collaboratively generate ideas, concepts through a range of stimulating activities. Although these techniques or methodologies include a synthesis of existing information as a precursor to the qualitative phase of content identification and generation, one important aspect is the methodology differs from the traditional use of in-depth interviews and focus groups which is that concept identification and content generation is a collaborative process. collaboratively to identify the relevant concepts and content. The emphasis is very much on interaction between patients and stakeholders and the sharing and building on ideas. Importantly however, it is for the patient to own the brief and to show us what they think, feel and experience, from which triggers, trends and actionable insight can be identified. Outcomes are relevant because s take holders are directly involved. Co-creative processes have a strong positive impact on the quality of the result. We would like to hear from you regarding your views on this post. Why not share this post with someone who might find it important.